The Food Crafters branded cookies use the gluten-free buckwheat plant for one of its main ingredients. Buckwheat is known for its grain-like seeds and is emerging as a popular alternative to wheat for gluten-free food. 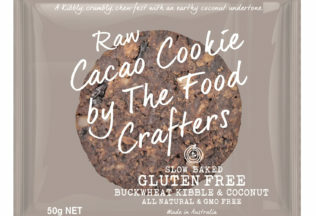 The Food Crafters brand was established by two Australian men, David and France Rechichi, who wanted to create indulgent gluten-free food which still has nutritional benefits. The pair already own Pizzaiolis, a business that produces gluten free pizza bases for the hospitality industry. Rechichi said he is excited to introduce the gluten free cookie range to Australia. “When creating the product, we needed to find a balance so the cookies were allergen friendly and tasted the way you would expect a cookie to taste,” Rechichi said. The cookies come in three varieties – Double Coconut, Raw Cacao and Ginger & Date. The Food Crafter Cookies are available at IGA, health food and independent food stores. The recommended retail price is AUD $3.80 for a 50g cookie and a 12-pack of cookies weighing 156g for a recommended retail price of AUD $9.10. Other products are expected to be produced by The Food Crafters in the near future. Coles says it is the first Australian supermarket to offer no added wax on its apples. How big will the seniors ‘functional foods’ market be in 2022? DAIRY giant Fonterra is applying itself to help find solutions to malnourishment in older people.